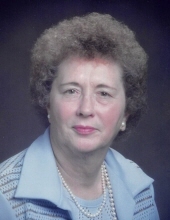 The Nelson family is saddened to announce the passing of their Mother, Grandmother, Great-Grandmother and Friend, Patricia C. Nelson at the sweet, tender age of 97. On Friday, April 12, 2019 Patricia joined her Lord and Savior. As she earned her angel wings she was surrounded by the love of her family. She was born in Johnstown, Pennsylvania, the daughter of Edward and Lillian (Long) Daugherty. Patricia was educated in Charlotte, North Carolina, where she attended Business School and worked in the Film Industry until her marriage. Patricia married Lt. Col. Arthur J. Nelson in Charlotte, North Carolina at St. Patrick’s Cathedral on August 4, 1945. She is a member of Presentation Catholic Church, North Fond du Lac, as well as a resident of North Fond du Lac since 1949. She happily worked in the public-school system for thirty-five years, fifteen years in North Fond du Lac and twenty years in Fond du Lac. The last years being at Friendship School of NFDL, in the Foster Grandparent Program, retiring in 2011. Given a birth date of March 17th she was also a member of the Irish History Club and the NAIM Group (for widow and widowers), Foster Grandparents and worked on the Election Board in NFDL for many years. Survivors include her two sons and two daughters; Ronald (Penny) Nelson of Fond du Lac, Timothy Nelson of FDL, Claire (Wes) Peters of Kamloops, British Columbia, Canada, Kathleen (Daniel) Jacobs of FDL; eight grandchildren, Jackie (Aaron) Buchholz of FDL, Bryan Nelson of FDL, Michael Nelson of FDL, Kristin (Caleb) Myram of Medicine Hat, Alberta, Canada, Barry James (Megan) Peters of Kelowna, British Columbia, Canada, Jennifer (Christopher) Grafton of FDL, Benjamin (Jourdan) Jacobs of Black Wolf, and Kurt (Gabrielle) Jacobs of Black Wolf; six great grandchildren; Kiera and Killian Buchholz, Aphten and Jake Myram, and Swayzie Peters, Kinsley and Henry Grafton, Griffin and Everly Jacobs. Special nephew, James (LaVonne) Nelson of LaCrosse, WI; special niece Judy (Jerry) Krueger of FDL, and their wonderful families. Preceding her in death were her parents, her husband Arthur on August 20, 1978, one brother, four sisters and three brothers-in-law, and a son-in-law (Wes Peters), and numerous friends. The family would like to especially thank the medical staff at St. Agnes Hospital, 5th floor, for the compassionate care and support they gave Patricia and family. Visitation will take place on Tuesday, April 16, 2019 from 9-11 AM at Presentation Church, 705 Michigan Ave., North Fond du Lac. Mass of Christian burial will follow the visitation at the church at 11:00 am. Burial will follow the service at Calvary Cemetery. To send flowers or a remembrance gift to the family of Patricia Claire Nelson, please visit our Tribute Store. "Email Address" would like to share the life celebration of Patricia Claire Nelson. Click on the "link" to go to share a favorite memory or leave a condolence message for the family.